AMD launched a bunch of code names, Epyc, Threadripper, Vega, and more with scant details. 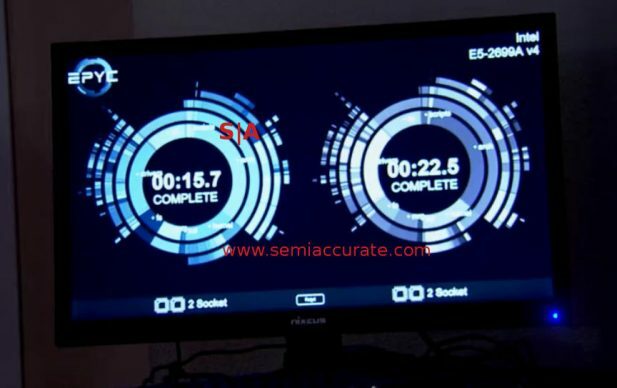 While SemiAccurate would love to talk about how cool these things are, without any details we can’t say very much. Note: You can read Thomas Ryan’s look at the official Epyc details here. During their 2017 Financial Analyst Day webcast, AMD went down the list of new items. Everything was said to be great, something we are willing to believe with more details, but there were some interesting nuggets in the mix. Lets take a look at the news which covers enthusiast, datacenter, and graphics. For this article we will look at the middle one, datacenter. First up is Naples aka Epyc, w0W, neet, and even eXXtreeem. We told you the details almost a year ago, mid-June 2016 to be exact, and since then not much has changed. It is still a 4-die 32-core MCM as you can clearly see from the delidded part Forrest Norrod held up. On a per-core basis it probably falls a little behind Intel’s Broadwell and Skylake CPUs but it has far more cores, likely a lower price, and more features. Then there is this which we will look into in detail later. AMD threw out some benchmarks that looked interesting, compiling the Linux kernel in a VM. Short version the unnamed Epyc CPU in a 2S configuration pummeled the top Intel Broadwell-EP, an E5-2699A V4 CPU silly. Sure it had twice the memory channels, twice the memory capacity, 20 more cores, and 48 more PCIe3 lanes, but as Forrest said, that is the point. AMD is almost assuredly going to undercut Intel on price here but until that figure and the TDP numbers come out, it is hard to call this a definite win. Details not only matter, they are almost the only thing that does and today they are completely lacking. 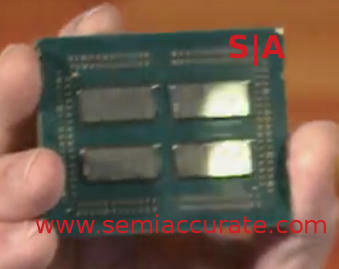 Fresh from the 40+% victory over the 2S version of Intel’s best AMD went on to show off the killer feature of Naples. 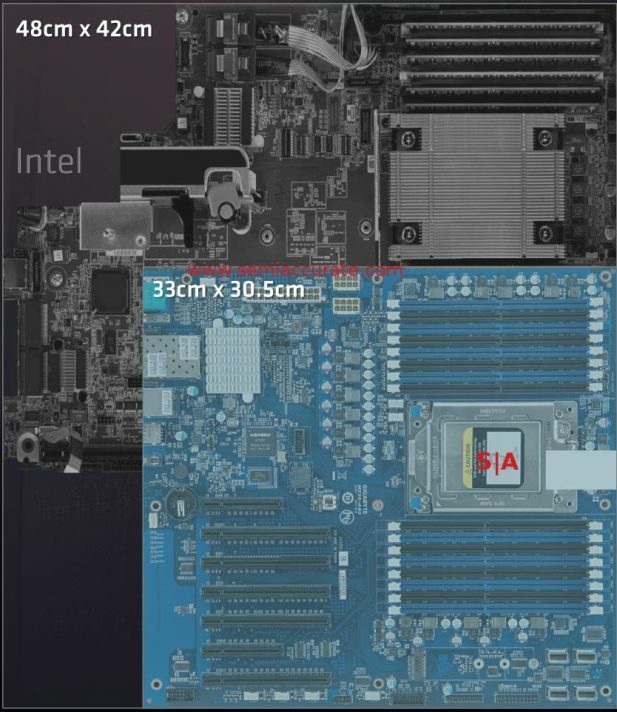 He put up the following slide about the SKU mix of Intel CPUs and pointed out that the above listed Xeon is a small fraction of the marketshare so a more representative benchmark would be against a part in the middle of the market by sales volume. That part would be the E5-2640 V4, a 12 core 4 memory channel 40 PCIe3 lane model. A single Naples beats it in every stat so AMD put two of them up against the AMD part. For reference a single Epyc ties or beats two Intel parts in every stat as well. And sure enough on the same Linux kernel compile test, AMD still beat the Intel pair 33.7s to 37.2s. One of these is smaller, can you tell? The killer feature is not the clean kill on speed but the board area. Depending again on power, price, and manufacturer support, AMD should be much more attractive to large buyers because it uses significantly less board area than Intel does. If you are not in the datacenter this may seem pointless but the difference for cost and TCO is immense, with AMD you can make more dense server racks and that is a killer feature for the datacenter buyers. Not only that but it has more I/Os, memory, theoretically takes far less power than the Intel solution. And is cheaper. One problem though and it is due to the fact-free presentation from AMD. That problem is the test itself, it is not exactly fair. SemiAccurate does not doubt the numbers or think the test was rigged in any way, if you do the same thing you will get the same numbers. The problem is that the test is claimed to be CPU bound, which it usually is, but in a 2S Intel system you have to traverse the QPI link between the sockets to get to storage and there are NUMA latencies to consider too. Compilation is a great CPU stress test but the QPI and NUMA headaches hobble the Intel part. This isn’t to say AMD picked a cooked scenario but if you did the same test against a 24C Intel stystem the Intel numbers probably would have looked better. More importantly the board area win would dissipate even if price, power, and features were still a clean kill for AMD. The take home here is that this win isn’t what it seems but it still is a win. 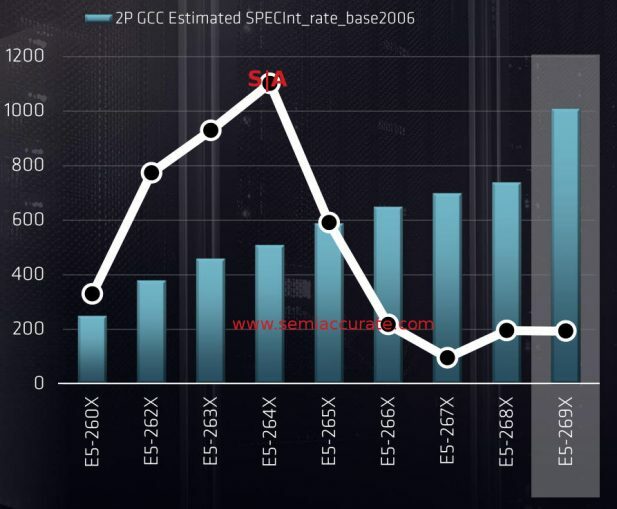 Once we get the numbers and data, SemiAccurate will have a more certain analysis on Epyc. Then there were the bits not explicitly said and there were some new interesting details there. Some of these are technical, some business related, but all interesting.